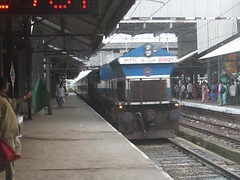 I had been to Panvel in the evening to pick up my sister-in-law who was coming from Kannur (Kerala) by Netravati Express. I reached the station at about 1730, and the train was scheduled to reach by 1645. I had expected the train to be late - & the train was late by 1 hour and 45 minutes! The outgoing Ratnagiri passenger was also delayed by an hour! At about 1810, the Passenger pulled in with WDM3A #18773 from Pune in charge. The passenger was held up at Panvel until the Diva bound 1696 passenger pulled in. The loco working the passenger was WDM2 #18068 from Kalyan. The Netravati finally pulled in at about 1900 with WDM3A #18338 from Erode in charge! That brought the day to an end! Meet ya tomorrow!